Custom Playset Designed Your Way! Do you already have a custom playset design in mind? Thanks to our new playset designer, you can make your idea of the perfect playset a reality. Don't fret, the easy to use designer will let you know what option fills in each slot. Use the location key above as a reference to determine what each letter stands for. Unlike our preconfigured models, the playset designer gives you the power to add monkey bars, swing beams, rock walls and slides in almost any location. You build it and we can deliver it right to your home! After you're satisfied with the custom playset design, you can simply add it to your cart or order by phone. If you get distracted and want to resume your design later, you can save it too. Why not share your design skills with your friends and family too? 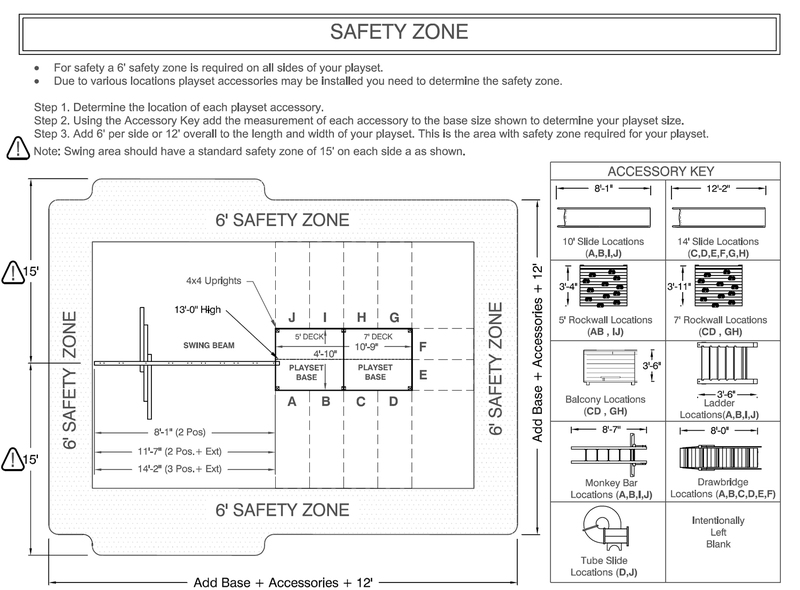 Don't worry; any empty positions/slots will be automatically filled with safety rails for your child's safety. We also offer professional installation on this swing set for $399. Only a few minor issues. I am very happy with the play set and only did not give it 5 stars due to the minor issues I had along the way. First off the wood is excellent quality and looks very nice once all put together. 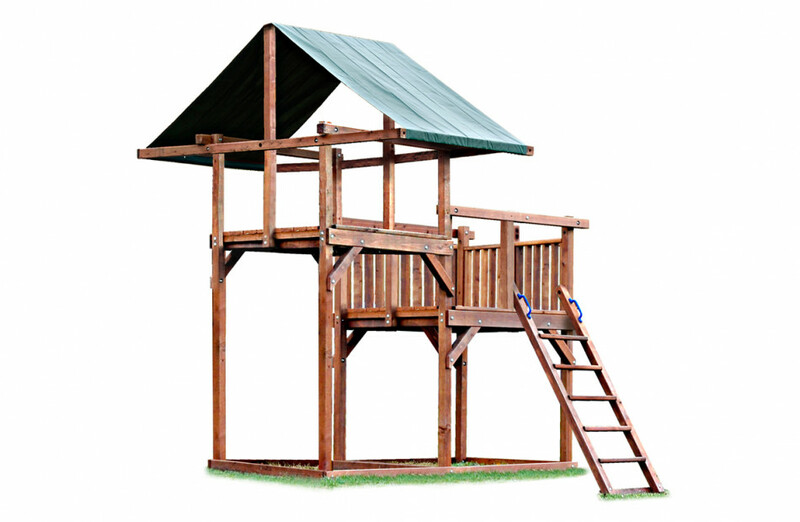 The structure itself is very sturdy and I was able to do every activity on it even being a 230lb man (the set is for my kids but couldn’t let me on it without testing first right!). As for the issues with the set they started with delivery as I decided to put the thing together myself and not pay for installation. I got conflicting information about when it was supposed to come and who was supposed to deliver it (the number attached to my order told me it was supposed to be delivered to their center then come to me and the main company line said it was supposed to come directly to me…). Once we got that straightened out the set was set on the curb so I had to drag it all (and it was a lot of pieces) to where I needed it. Once I got started building everything went pretty smooth and most of the holes lined up and pieces fit together as the directions showed (took me probably 2 full days with 2 helpers one day and 1 person helping the next). The only thing that didn’t work was the swing beam had the holes drilled wrong and they didn’t send me the correct pieces I needed for the monkey bars. So I called customer service and the quickly said they would send me a new one and the two other pieces I needed for the monkey bars. They arrived in a little under a week and the new swing beam was perfect. The two pieces for the monkey bars (you were supposed to replace the 6 and 297 pieces that come with the main kit with a 6A and a 297A) just sent me more of the same things I already had… So I had drill a new hole myself in one of the pieces to get it to work properly but overall not a huge issue. So as I said a few minor issues but overall the set is awesome and the quality is overall pretty good! Customer service fixed the swing beam issue swiftly without giving me a hard time. So I would say they have a pretty satisfied customer! I trust the safety of this swing set for my grandchildren, and feel the quality will still be there for their children to enjoy. Ron Locandro, a Mr. Handyman owner in Connecticut, just called with an update on a Kid's Creation playset they just assembled. He said it went great and the customer is delighted! Ron commented that the installation instructions were clear, the quality of the materials was very high and things fit together perfectly. He has a couple more installations scheduled and is looking forward to them. Thank you for the opportunity to work with Kid's Creations. If you have any questions, or if any Mr. Handyman owners call with questions, feel free to direct them to me. Words can not describe how shocked I am that you drew us for your giveaway! Our entire family is very grateful for your generosity, I'm quite sure there is no other company, that would do such a thing. I did quite an extensive search for a durable, not to mention quality product. And I most definitely found that in Kid's Creations! A fellow firefighter and myself had pretty much all of the structure (clubhouse, swing-beam, ladder, rockwall, ropeladder, gangplank) assembled in about 4.5 hours. Great instructions, easy to follow (read twice assemble once)! You were definitely correct in reference to the "Father Thing". Anyway, long story short, thank you and your "TEAM" so very much! Rarely in these days does it seems you get what you pay for. In this case I got what I paid for and more! After snapping the 4x4 posts by dropping one side of the tower, Kids Creations helped me so I could finish the tower and then to my surprise overnighted the replacement posts!! You have a great dedication to customer service and you exceeded my expectations by turning a tragedy (in my 3 kid's eyes) to a triumph. Thank you again for providing such an outstanding value coupled with genuine customer service. Thank you for everything you've done to make this possible for our daughters. We were beyond satisfied with your product and customer service. Surprisingly, my husband and a friend were able to complete most of the project in one very long day. Our daughters have spent everyday outside playing. We have eaten breakfast, lunch and dinner on the picnic table. We are 200% satisfied. We would be happy for you to post any videos or pictures. Building instructions were good and it's big enough to keep 3 kids happy all day. We had ordered a swingset and had a few issues with some of the material. The material was replaced with no problems we are very happy.